People living in villages and towns along a rural train route are being urged to get involved and safeguard the future of services. The Grantham to Skegness line is among seven in the country to be piloted as a 'community railway'. It is hoped the programme organised by the Strategic Rail Authority (SRA) will get local authorities and businesses to invest in services. One proposal is for trains to be hired to meet demand through the summer. One such line which has already benefited from the new measures is in North Norfolk, where passenger numbers between Norwich and Sheringham have grown by 162% over seven years. Guy Dangerfield, from the Rail Passengers Committee, said: "This is good news for passengers because you're only going to get 100% people through the door if the standard of service improves. "The crucial issue with the Skegness line is that in the summer there is very heavy loading and often not enough seats. "One of the things that will be explored is whether by hiring a train it is possible to reduce the costs and bring into use during July and August to increase the number of seats." Local councils are to meet with the SRA to discuss the scheme and look at ways to safeguard the future of the line. 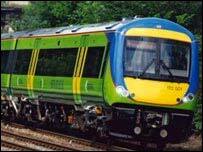 If the scheme is successful, a further 49 railways around the country could be made into community routes.